This is a third post in a series dealing with very short or very long distances between atoms. Ishigaki, Shimajiri, Takeda, Katoono, and Suzuki have prepared three related analogues of hexaphenylethane that all have long C-C bonds.1 The idea is to create a core by fusing two adjacent phenyls into a naphylene, and then protect the long C-C bond through a shell made up of large aryl groups, 1. Fusing another 5-member ring opposite to the stretched C-C bond (2) creates a scissor effect that should stretch that bond further, even more so in the unsaturated version 3. Their M062-x/6-31G* computations predict an increasing longer C-C bond (highlighted in blue in the above drawing): 1.730 Å in 1, 1.767 Å in 2, and 1.771 Å in 3. The structure of 3 is shown in Figure 3. Figure 1. 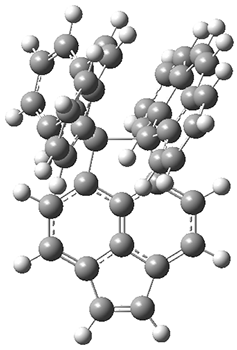 M06-2x/6-31G(d) optimized structure of 3. These three compounds were synthesized, and characterized by IR and Raman spectroscopy. Their x-ray crystal structures at 200 K and 400K were also determined. The C-C distances are 1.742 Å (1), 1.773 Å (2) and 1.798 Å (3) with distances slightly longer at 400 K. These rank as the longest C-C bonds recorded. 1) Ishigaki, Y.; Shimajiri, T.; Takeda, T.; Katoono, R.; Suzuki, T., "Longest C–C Single Bond among Neutral Hydrocarbons with a Bond Length beyond 1.8 Å." Chem 2018, 4, 795-806, DOI: 10.1016/j.chempr.2018.01.011.